Last December in Pittsburgh, Temika Green was randomly handed several hundred dollar bills by a complete stranger dressed as Santa Claus. Green, who was a program coordinator at a local YMCA, said she was going to use the money to help the kids in an afterschool program. “Yeah, well, I’ll put another couple hundred in there,” the man told her. “And I’ve got to quit talking to you. I’m running out of money. We love you. You’re doing great. Don’t stop,” he told her. 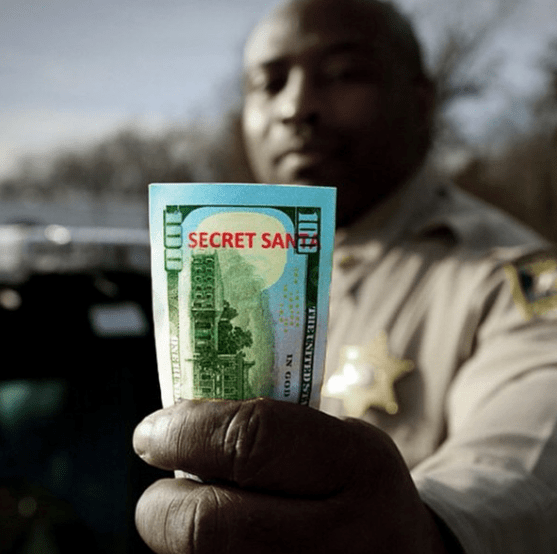 Every year a wealthy businessman from Kansas City, known as Secret Santa, hands out $100,000 in hundred dollar bills to total strangers in his own city as well as in other places. This anonymous “angel” enlists the help of local law enforcement officers, who serve as “elves” to hand out the cash. Who is Secret Santa, anyway? A Christian? A Jew? A Muslim? Who knows? An African-American? A Hispanic? A gay man? Does it matter? All he looks for is people who seem as if they could use a little caring in their life. Which means most anyone. “Kindness is the bridge between all people. Kindness is the one thing that cuts through everything regardless of your station in life,” explained Secret Santa last December. Over the years, he’s discovered that it’s not the money that causes people to start crying when he hands them a $100 bill. It’s the kindness of someone noticing them and caring. How is the fruit of kindness evident in your life this Christmas? Gherica Lewis was frightened a year ago as she was walking along a street with her ten-month-old daughter and the girl’s father. She heard the sirens and saw five squad cars stop near her. Lewis was in Ferguson, Missouri, the place of African-American Michael Brown’s shooting death in August 2014 by a white police officer and subsequent riots. How will you show kindness this Christmas by advocating for those who have no voice and are frightened for their future? The current Secret Santa is following the example of his late friend Larry Stewart, who distributed an estimated $1.3 million to the needy in Kansas City and other communities for over twenty-five years. It wasn’t until shortly before Stewart’s death in 2007 from esophageal cancer at age 58 that he publicly revealed his identity. Meanwhile, another Secret Santa couple came to Detroit last December for the eighth straight year to hand out hundred dollar bills to those in need. Also modeling their ministry after Stewart, Mrs. Claus said, “I really believe that the only thing that can overcome hatred and evil in the world is love. And you can’t really overcome hate and evil with love if attached to that love is a spirit of judgment. It just doesn’t work.” The Secret Santa duo gave $1,000 to a man who had just left prison as a parolee after twenty-five years behind bars. They also went to a food bank, senior citizen community, and thrift shops. How will you love kindness during this Christmas season by reaching out to someone who is not like you or whom you have been tempted to judge? Secret Santa already appeared in mid-November this year in Kansas City with random acts of kindness as well as Thanksgiving and Christmas cheer. Sherman LeJeune heard loud police sirens outside his apartment on the night of November 19 and assumed someone was in big trouble. When multiple law enforcement officers got out of their cars, he expected they would be pointing their guns. Instead, they were carrying coloring books, large candy canes, and smiles. Some even wore red hats. The kindness is spreading. Last week, for the fourth year in a row, a Secret Santa dropped a 1980 South African gold Krugerrand into the same Salvation Army red kettle at a Kroeger store in the Detroit suburb of St. Clair Shores. The coin’s estimated worth? $1,200. Also last week, a secret Santa couple handed a $1,000 check to principal Amy Larcinese at H.W. Good Elementary School in rural Herminie, Pennsylvania. They asked that the money pay off the overdue accounts of forty students whose parents could not provide for their children’s lunches. The couple decided to pay it back because their daughter graduated from high school there thirty years ago. Maybe there is something to this kindness stuff. Imagine the witness we could make if disciples of Jesus Christ were kind to each another, let alone to the rest of the world, and especially to those who are not like us. What if we even offered for a guest sit in “our” pew on Christmas Eve? We love you. You’re doing great. Don’t stop. We care about you. For there’s hope out there, and kindness is the bridge. How will you be a bridge of kindness during this week before Christmas? May God bless you and our world during this most holy time of the year. The next Leading from the Heart will be published on Tuesday, January 3. This is a beautiful advent post that underlines the true meaning of the Christmas Spirit. I have always believed that you never regret an act of kindness. Thanks Bishop Laurie – your reflections always bless my spirit and challenge me toward action!!! Christmas Peace to you and your family. Thanks, Bishop Laurie – for helping us see the joy of being a giver to everyone, not just our family, but to those who need it the most. Would that I was a millionaire – so I could pass out money like the examples you shared! What joy that would bring, but I do what I can and it gives me pleasure. How thankful I am to look forward to your loving and caring thoughts each week. They mean a great deal to me and help to fill the void of your physical presence.My love and prayers are with you always.